We’re playing on Rainbow Castle. I’m controlling Mario, trailing just behind my brother (Luigi) who holds two stars to my one. There are only two turns left. On my turn, I stand only five spaces from the top of the tower, where Toad will sell me a glorious radiant Star for the low price of 20 coins. I crack my knuckles and smash the A button on my controller. I watch in horror as the dice block explodes to reveal a massive “4.” Mario dances obliviously across four spaces, ending just one tile short of the cloud that will take me to Toad and seal my victory. I squeal in frustration. My brother howls with laughter and takes this turn. He is only six spaces back and cannot wait to take that star away from me. He only rolls “2” and his smile fades. I regain my composure. I still have a chance. The relief is short-lived. That familiar knot reappears in my chest as Luigi lands on the dreaded green “?” space. My worst nightmare is realized as Rainbow Castle’s board gimmick activates, and the kindly Toad is replaced by the devious Bowser, just one space ahead of me. My jaw drops and my brother, yet again, cackles loudly. My final turn is short, albeit filled with sheer horror. I hit my dice block and have no choice but watch as Bowser sells Mario a fake Black Star—worth absolutely nothing—for the ludicrous price of 50 coins! Bowser empties my entire wallet, and I proceed in shame to the next space with absolutely nothing to show for it. But, before the game ends, the gimmick reactivates and the conniving Bowser leaves, only for the smiling Toad to reappear. The nightmare reaches its climax as I watch my brother prance over to Toad and purchase his game-winning star. Not only have I lost MARIO PARTY, I have lost to my brother. It will be weeks before I recover. There might only be one video game series in existence that rivals the same mix of excitement, frustration, and pure madness provided by MARIO KART, and that is its virtual board game cousin, MARIO PARTY. 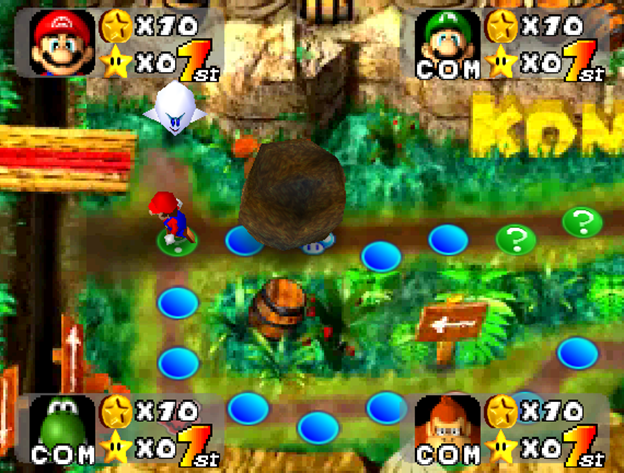 Originally released in 1998 when Nintendo formed a partnership with developer Hudson Soft, the company that created numerous Bomberman titles, MARIO PARTY was among a few titles of the N64 era that attempted to translate traditional board game principles into robust interactive experiences. Almost every one of these games ended up as an extreme disappointment, often due to poor controls, ill-conceived gimmicks, or limited budgets. MARIO PARTY, on the other hand, was a wholly unique beast, and it is with good reason the game spawned a series spanning over 20 entries across numerous consoles and generations. The rules are basic: four players navigate a board, littered with numerous spaces that either help or hinder their goal to find or purchase Stars. The player with the most Stars at the end of the final turn is named the Superstar and wins the game. Each stage offered various layouts or gimmicks that made each game unique. Luigi’s Engine Room is accented by pipes that can be used as shortcuts, and Wario’s Battle Canyon comes equipped with cannons that shoot players to different sections of the board. MARIO PARTY’s natural simplicity it what makes it work. There are no complicated rules, no focus on strategy or complex moving parts. On each turn, players hit the Dice Block and just watch what happens. It is mostly a game of chance. As the characters and boards animate, the game feels alive and exciting. The primary drive is about interactive fun, not victory. In that sense, MARIO PARTY defies the board game genre. Of course, everyone wants to be the Superstar, but MARIO PARTY is most rewarding to those who are just there to have a blast. This dice-rolling is addictive, yes, but it is the trademark mini-games that punctuate the game that serve as the true lifeblood of MARIO PARTY. At the conclusion of an entire round of play, every player is thrown together for a single mini-game, lasting no more than a few minutes. Easy to pick up and relentlessly entertaining, these games help break the simple monotony of moving throughout the board and enhance the gameplay experience. The roster of diversions is extensive, numbering over 50 in the original game. Some of them might include blowing the biggest Bowser balloon, or rolling your character around on giant boulders to knock your opponents off an island. In addition to providing short and sweet bouts of competition, these mini-games lend a skill-based alternative to the purely luck-driven dice-rolling. Even if you are lagging behind on the board, you could always count on the mini-games to get a leg up on your rivals. The flip side to all of this is that MARIO PARTY was always as frustrating as it was entertaining. Numerous relationships have been annihilated by one unfortunate match of Mario Party. The bulk of the original game was determined by sheer luck: the roll of the dice blocks. That tiny number that determined movement meant all of the difference. On any given turn, that number could land you at a Star, send you hurtling back to the start, or, yes, place you face-to-face with Bowser. At its core, MARIO PARTY is about testing relationships. By sheer chance, you are forced to watch as your character offers mountains of gold to your best friend just because of a poor dice roll. Or worse still, you watch as your childhood friend spends 50 coins and steals the only precious Star you have. All you can do is watch as the sly Boo floats over to your corner of the screen and evaporates your Star. A blissful Saturday hangout with virtual games could devolve into real-life fist fights over the infuriating results of your average MARIO PARTY session. That is why I abhor MARIO PARTY. That is why I absolutely adore it. There is some contention over what the best party game on the N64 was. MARIO KART 64 and SUPER SMASH BROS are popular among Nintendo fanboys, and never count out split-screen GOLDENEYE 64. But as far as I’m concerned, it has, and always will be, the OG MARIO PARTY. A lot of that comes from accessibility. It doesn’t require extreme explanation or dexterous fingers. It’s a simple board game with short and cute mini games. There are over 20 entries in the series, but the original still works wonders. The game works today just as well as it did then, and literally anyone can pick up at play, because no matter who is holding the controller, Lady Luck is the one at the wheel. Next time you have three friends and nothing to do, dust off your old N64 and throw in MARIO PARTY. You’ll see what I’m talking about. Jason Pedroza is a Merry-Go-Round contributor who really likes stories and spends most of his time lost somewhere in his own imagination. He will love you forever if you offer him a Slurpee or some candy.